My high school senior class participated in an age-old tradition at the end of the year titled “senior ditch day”. The school did not sanction it but everyone was part of it. A group of us spent a sunny spring day at Six Flags. It was fun and we felt ridiculously spontaneous, free, and rebellious. In the past years our school has offered a senior trip during trip week in which seniors planned their entire trip on their own. Truthfully, it turned out to be more of a vacation than a school trip. This year, in an effort to give more valuable IB time to the seniors, they were provided an “extended essay week” to work on their extended essay and other IB assignments. They were promised something special after IB exams. So, yesterday the 12th graders had their “senior day”. They met for breakfast at the school and participated in a mini-graduation ceremony for two seniors who will not actually be here on graduation day. 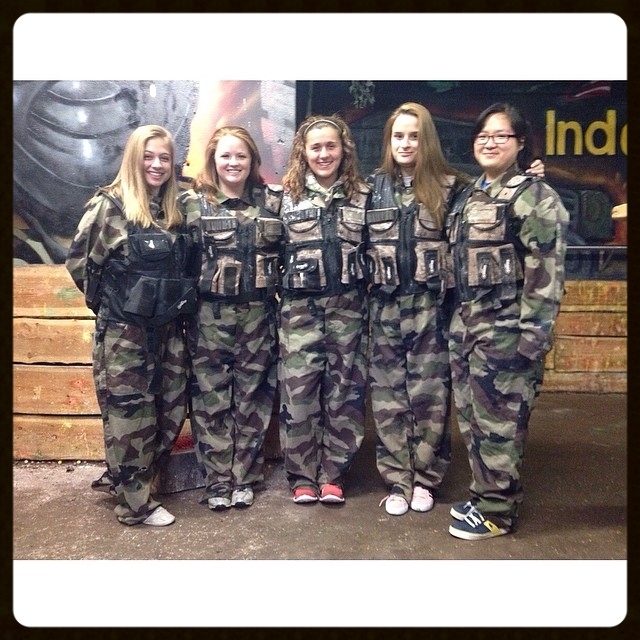 Then, they were off for a vigorous game of paintball. Following lunch they were back at the soccer fields behind the school for a game of bumper soccer. Apparently that proved to be 100% hilarious and fun was had by all. Finally, the day ended with a barbecue at their homeroom teacher’s house. An abundance of delicious food, a pool tournament, and mingling with friends and teachers ended the day perfectly. Even we, the IB teachers enjoyed this event. It seems to provide both a celebration and closure of high school while simultaneously looking forward to the future. It wasn’t the historical “senior trip” but it was fun for the students and perhaps it will become a new tradition at the school. What do you think? Is there value in a “senior trip” or “senior day”? The seniors have commenced on the final leg of their journey towards graduation. Last week they gathered on the SS Rotterdam for their senior group picture. When there are only 12 graduates you can do things like that. Just before departing, in their caps and gowns, for the photo shoot on the ship, two representatives appeared in our staff meeting to announce the senior class gift, a long-held tradition at our school. The seniors, each year, select a gift to give to the school by which they will be remembered. Past gifts have included a large clock engraved with “For all the Good Times” in the entryway of the school and a tree planted in the playground. On this day, two young representatives stand before us, flushed with excitement and glowing with pride. With animated gesticulations they describe how they participated in the school’s garbage audit this year and that the audit experience prompted their senior gift. They proceed to describe the purpose and results of the audit. An accounting of the plastic cups accumulated in just two days in the teacher’s lounge yields exclamations of shock and disbelief. For the staff of 70 (some of whom are part-time), it is a bit embarrassing to consider that the paper cups from the teachers’ lounge alone represented 1.5% of the entire waste of the school (including cafeteria, classroom, and science waste). Mug wall designed by Christian Ward for the ready made 100 contest. Link to the site. The seniors then announce that their senior gift would be to build a mug wall in the teachers' lounge, eliminating the use of plastic cups. They are planning a “mug drive” to load the wall with donated mugs (rather than increase carbon footprint by purchasing new mugs). Their gift, as it turns out, additionally includes an act of service. Nods of approval and smiles of encouragement are seen sweeping across our group of teachers. Clearly, this is a good idea. With confidence and purpose our vibrant seniors depart through the library doors; their shiny, blue, freshly pressed graduation gowns flowing behind. Moments like these make the teachers proud and leave evidence of how ready these young people are to go out and conquer the world. What special senior gifts or traditions are common in your area, at your school or at the school your children attend?